The Young Street Gospel Hall in Truro is hosting a ‘Free Community Coffee’ every Thursday. This outreach was initially the exercise of one sister but several other sisters share in the responsibility by taking time out of their day to make sure they are at the Hall to prepare the coffee/tea and refreshments. Initially we planned to host the ‘Community Coffee’ every second Thursday. However, because of support from others, we decided to host the event every Thursday morning from 10AM to 11:30AM. Sometimes it stretches out to 12:30PM when visitors stay. We are encouraged by the visitors. We have had more visitors this year than last, probably due to more advertising. 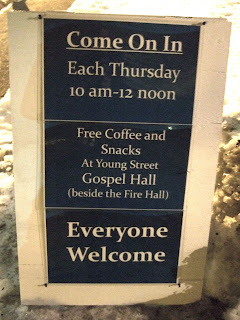 We didn't advertise last year, other than our sign outside the Hall on Thursday morning. This year we decided to put advertisements in the grocery stores, local food bank, and in the newspaper. We have a table set up with Tracts, Texts, Bibles, etc. Visitors often take the literature as they leave. This year we also have a guest book and invite all visitors to sign. We have been recently encouraged with a young mother coming and her three children (8, 5 and 1). They live close to the Hall, and it seems the children would like to come to Sunday school.